Renowned for their contemporary appearance and durable build, Korniche’s expertly engineered aluminium rooflights have good ventilation and healthy living at the forefront of design. 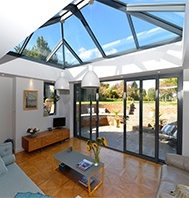 Designed & manufactured in the UK, Signature are a specialist producer of flat glass roof windows and walk-on rooflights that transform home extensions into brighter & healthier spaces through the introduction of natural daylight. ECO+ flat roof windows are supplied with an integrated 150mm upstand, making ECO+ your ideal lighting solution if designing a flat roof extension from scratch and equally suitable if adding natural daylight to an existing roof. Established in 1991, FAKRO are one of the world’s leading manufacturers of roof windows, rooflights and loft ladders. Expertly engineered in the Czech Republic, Lightway Crystal sun tunnels allow natural daylight to flow in from the roof through a highly reflective tube to brighten up any spot in the home that needs bringing to life. One of the utmost value for money roof window brands in existence, RoofLITE windows are contemporary options that offer many of the same outstanding qualities as sister brand, VELUX, at a budget friendly price that will not break the bank. Feeling overwhelmed? Afraid of making a mistake? We can provide expert advice, absolutely free. Sterlingbuild Ltd is now a member of the National Federation of Roofing Contractors. Find out what being an NFRC member means for Sterlingbuild and our standards. VELUX blinds are the perfect way to control daylight and temperature in your extension or loft conversion. Read our easy step by step guide to finding the ideal VELUX blinds for your project. Free delivery available on VELUX blinds at Sterlingbuild. Discover the Keylite Polar PVC roof window, an exceptionally thermally efficient and easy to install roof window for loft conversions and home extensions. Shop now for free delivery. Discover the VELUX INTEGRA electric top hung roof window. the ultimate in convenience for loft conversion and home automation. Compatible with VELUX ACTIVE and available at the best price online and next day delivery. Receive expert advice and exclusive deals every week straight to your inbox. You can unsubscribe anytime and we will never share your email address. Here at Sterlingbuild we specialise in daylighting homes through the supply of high-quality fenestration products and glazing systems. With a strong focus on home extensions and loft conversions, we are the largest independent retailer of roof windows in the UK and the country's number one VELUX stockist. Among the thousands of roof windows, rooflights and doors we sell, you’ll find industry leading brands such as Korniche, ECO+, RoofLITE, FAKRO and Lightway. We cater for both pitched and flat roof new build and refurbishment projects by supplying all the necessary pieces you'll need to satisfy your home improvement needs, from flashing and blinds to bifold doors and sun tubes. Our price match promise guarantees to match the price of any product should you find it cheaper at another online retailer. We offer free standard delivery on all orders over £100 with next day delivery available on select products, as well as international delivery. For the more specific home improvement requirements, many of our product lines come with bespoke options on size, glazing, colour, operation and more. This applies to all of our aluminium doors, roof lanterns and Signature rooflights.